The new line of pre-packed Citterio meats. Naturally good. 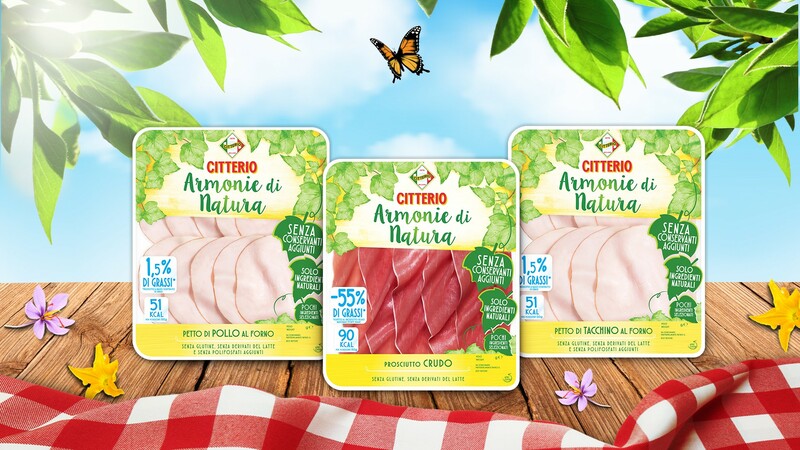 Without added preservatives and naturally full of goodness: the Armonie di Natura range has arrived, the new line of pre-packed sliced meats from Citterio. Available in the best supermarkets from July, they come in three different varieties: Oven-cooked Chicken Breast, Prosciutto Crudo and Oven-cooked Turkey Breast. Prepared with a few carefully selected ingredients, 100% natural and without added preservatives: in every soft slice you can taste all the authentic flavour and quality of Italian delicatessens, in a simple recipe, with few ingredients and an unmistakable taste. The new Citterio sliced meats are naturally good and light, designed for those who are looking for a reduced-fat product: only 1.5% fat in the oven-cooked turkey and chicken breast (51 kcal per 50g) and 55% less fat in the prosciutto crudo. Finally, Citterio's Armonie di Natura will also seduce you whilst respecting the environment, thanks to packaging that uses 60% less plastic and has a recyclable paper tray. Try them all, they’re good for nature!